I make my students build and use models on a daily basis in my classrooms. I think that I have a better than average grasp on the Next Generation Science Standards, their practice and three-dimensional lesson planning. But I have apparently never thought to throw a bunch of vocabulary words at my students and give them the time to really struggle to connect them into a cohesive model with their groups. And at the end of a session on Cognitive Models, presented by AP/IB Biology teachers Lee Ferguson and Ryan Reardon, that is exactly what we did. To start, the instructions were sparse: Create connections and uncover relationships between pancreatic β-cells and photosynthesis. My group was made up of six other AP Biology teachers from 4 states, none of us with any idea where to start. There was some discussion about the significance of the color of each card, which it ends up wasn’t important… there just wasn’t time to sort them before the session. We eventually found the word “Metabolism”, which we all agreed was the one thing that all the cards shared. From there, we tried to make shorter stacks of cards that were related. For example, “Hyperglycemia”, “Blood sugar rises”, and “insulin”. Once we had all the cards grouped, we tried to place them into a pseudo-concept map. In our classrooms, I would have probably done this on a big whiteboard so we could draw arrows and write connecting terms, but my group guess that the Sheridan didn’t want us writing on their table cloths. 🙂 As we went, we had to stop and rearrange our map several times and each time we edited the map, members of the group were justifying why some cards had to stay or move. It was a really great conversation and I learned some things about feedback loops that I don’t think I had ever known. At the end of the process, we were encouraged to go look at what the other tables had put together and reflect on our map. To my surprise, none of the other groups had anything resembling our model. Talking to some of the other groups, I don’t think that anyone had a model that I think failed to achieve the original objective. It was really a powerful reminder that students, no matter the amount of information they may possess, each approach a problem from a unique viewpoint. And when you have people put together information, even people that all know “the right answer”, there are many ways to arrive at that conclusion. Needless to say, next week when we start preparing for our next test in my 9th grade Biology class, my students are getting a stack of 3×5 cards tossed on to their tables. I can’t wait to hear their conversations and see what they create! 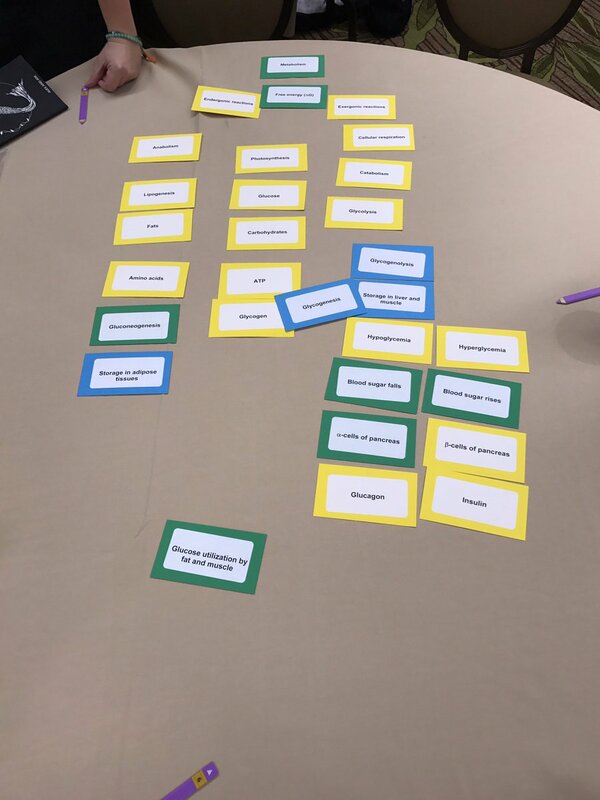 This post is part of a series of posts from KABT members reflecting on some of the most important things they’ll bring back into their classrooms from the NABT 2016 Professional Development Conference.